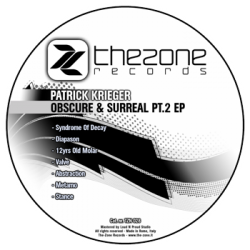 Dark, surreal, spatial, mental, futuristic, hypnotic and much more to describe the new real double project of The-Zone Records signed by German artist Patrick Krieger. A work characterized from a completely ambient sound belonging to parallel worlds very far away from the hearth. Scenes full of mystery and spirituality alternate to futuristic and industrial environments. Aliens signs seems to drive the pass of the old shamans rites. Environments sound dark and surreal that only the technology of the Electronic music can creates. Patrick Krieger’s style full of love for analogic instrumentation, seems to listen at the production of the first half of the 90’s of the Reload Ambient Records. Far away from the dynamics of a market which aim to commercial dance floors but prepared for an audience that want to escape from classic and formal schemes. An invitation to appreciate the esotericism of a world of mystery that darkness and night have always led with them!